Home> What is Effective Porosity? Note: This is a total porosity evaluation in which shale porosity is evaluated as non zero and has an Ro-porosity (m) relationship. One of the many reasons for adopting total porosity is that the relationship between shale volume and Ro is revealed to the log analyst. In effective porosity evaluations the analyst is denied this information because the porosity parameter disappears as shales are approached, denying the petrophysicist powerful, cheap information for shaly sand evaluations. If the petrophysicist wants to understand tool responses – which respond to the whole formation not bits of it – during the petrophysical investigations shale porosity should not be hidden and Sw should not be truncated at 1.00. If your users prefer the cosmetics of effective porosity display it after you have finished the evaluation. “ ’Total’ porosity is useful for the calculation of porosity and water saturation. 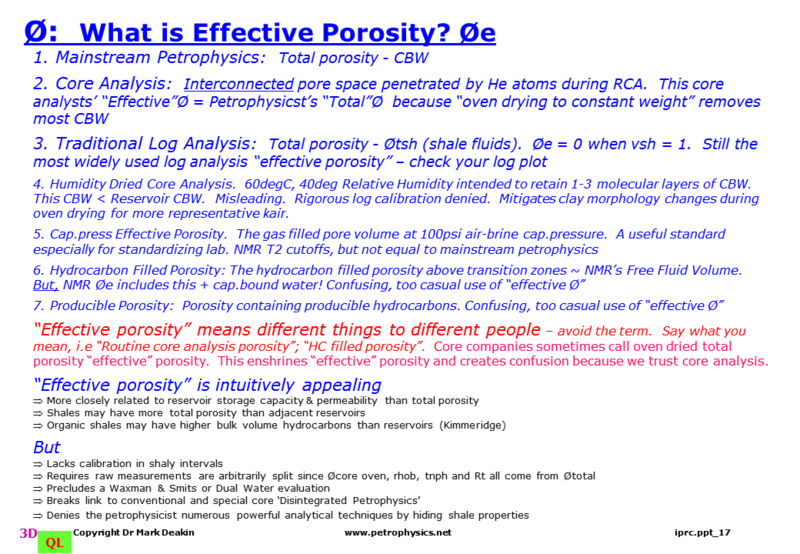 Core porosity measurements usually give total porosity. E&P managers need to know something different. They need estimates of potential reservoir thickness, ’effective’ porosity, permeability and the volumes of producible hydrocarbon and water. ‘Total’ and ‘effective’ porosity are equal in non-shaly reservoirs, and may be nearly equal in shaly sandstones containing clays (other than smectites) with little clay-bound water in the clay structure. In shaly sandstones containing hydrated clays (smectites), ‘effective’ porosity may be much less than ‘total’. Immature smectite shales with ‘core’ and ‘total’ porosities of 23% are impermeable non-reservoir rock. Capillary Pressure Mercury Injection Data (MCIP) for Saturation Height? .. In addition mercury data generally cannot be used for Sw-Height in a clayey low permeability rocks unless Cation Exchange Capacity and Clay Bound Water corrections have been made. During a mercury experiment a water phase is not present to wet the clays and fine pores and the mercury bulldozer barges its way through delicate clay lined throats, so, unlike air-brine data, mercury saturations provide a poor analogue for reservoir saturations. Mercury data provides pore throat size information for rock typing. This lack of a water phase is especially important here where Clay + Capillary Bound Water is a significant fraction of total porosity, as implied here by the 100% + difference between the air-brine and mercury data sets for the same reservoir height. Hence, despite the need for a resistivity independent bulk volume hydrocarbon these data have limited ability to supply a usefully accurate dm-m scale whole rock storage capacity. Netpay definition: The objective of Netpay is to delineate intervals containing fluids which make a contribution to production during the life of the field. Fluids which move or experience a change in saturation or pressure during production will make a finite, if small, contribution to production. Hence if cutoffs are used the root criteria should be fluid movement, that is permeability, and saturation to imply which phase will move, not porosity or vshale. In the opinion of this author cutoffs are not necessary if permeability has been evaluated to within about 1/2 log cycle and correctly averaged in the reservoir static and dynamic models, indeed they will usually add error. Large errors in simulation are frequently caused by cutoffs – to blank out large volumes of rock, typically more than 50% GRV, as zero storage, zero permeability is usually more wrong than to at least approximately quantify their bulk volume hydrocarbon and permeability. This is especially true in low permeability, dry gas reservoirs. Elan, Multimin, Mineral Solver. Probabilistic or Deterministic Petrophysics? Imagine your reservoir as a road cutting. It contains a certain amount of hydrocarbons (EHC, m) and has a certain Flow Capacity (kh, mDm) regardless of what scale we choose to describe it at: 15cm (logs), 1m (static geo-model) or 5m (reservoir simulation geo-model). All models must honor these facts. If they do not they are wrong. These facts cannot be dismissed as “an upscaling problem”, an attitude commonly expressed in meetings. The permeability averaging method is not a fact about the reservoir. It’s flow capacity, kh, is. The averaging method must equal our best estimate of kh and is simply the mathematical device which achieves this value for kh in the upscaled cell. The best estimate of kh is typically the petrophysical well test calibrated, effective kh. The “averaged” permeability’s impact on the geo-cell Saturation-height calculation must be treated subsequently to honor the petrophysical EHC, but must not be allowed to violate the cell’s factual kh value. A heterogeneity variance k factor, from the petrophysicist for each geo-cell interval in the log data, may be inserted into the saturation height formula to achieve equality in EHC and kh across all scales of reservoir description. The k variance factor is a tuning parameter, a mathematical device which achieves our objective (as with m and n in Archie’s equation..). The final result must be equal EHC and kh at all scales. Geomodel Checksums. Export the geo-model’s grid upscaled, summed EHC and kh back into petrophysical software. The total EHC and Flow Capacity of the rock must be equal at all scales. Symptoms of problems are fudged Relative perms, kver/khor, or HCIIP to history match.